Thermogenics have always been the key to speeding up your metabolism. By turning up your core temperature, your body spends more energy, which would then kickstart lipolysis that turns fat into energy – which your body burns as well, thanks to thermogenesis. With a caloric deficit diet, any person that would take thermogenics could guarantee weight loss – but some products claim to help you burn fat faster than any other product, such as Alphamine. 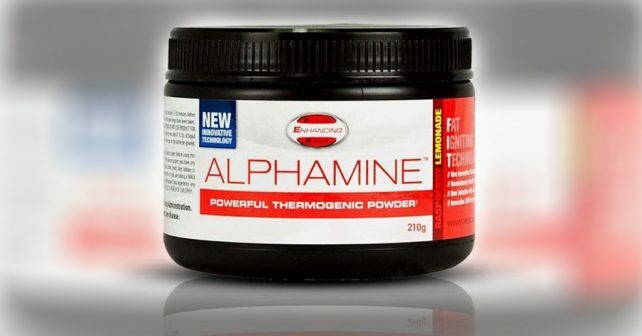 Alphamine is a thermogenic fat burning supplement that promises to redefine the way you think about thermogenics. One of their ‘breakthrough’ ideas is to let the user decide how much thermogenics they want, up until a safe dosage ceiling. This way, users can find their own sweet spot that lets them burn fat the way they want to. This is hardly a breakthrough, since there are many other thermogenics that are delivered in powder form. Is that all that Alphamine offers? Read the rest of the review to find out. Alphamine contains approximately 125mg of caffeine anhydrous per serving (1 scoop). 125mg of caffeine is roughly equal to two cups of coffee, and bumping the dosage would also mean that you are increasing your caffeine intake. While you find your right dose in Alphamine, consider your other caffeine intakes such as pre-workout supplements, caffeinated drinks, and energy drinks. Caffeine is everywhere for anyone who is working out, and it’s all far too common to see bodybuilders overdose on caffeine. Alphamine is used by people who want to speed up their metabolism to burn fat faster. Whether you live an active lifestyle or not, Alphamine can help control your weight while energizing you for your workouts. The ‘unique idea’ of Alphamine to make their product available in powder form is hardly a breakthrough. While most fat burning pills are presented in pill form, it’s not something that fitness experts would consider a ‘flaw’ like what the makers of Alphamine suggests. Letting users decide on how much they want from their fat burning supplement has its own pros and cons. It helps users find the dosage that they are comfortable with, but upping the dosage would also double up on your caffeine intake. This is extremely dangerous as some users might not be able to keep track of their caffeine intake, which could lead to dangerous side effects. On the bright side, you can never go wrong with caffeine when it comes to fat burning targets. Caffeine kick starts lipolysis which burns fat and gives you the energy you need when working out. Always opt for the safer dose. There’s no use in dealing with risky supplements when there is an ideal dose for you. The dosage prepared by manufacturers are always within the safe limits of the supplement, so you won’t have to worry. If you have a choice, stick with a thermogenic blend that is in pill or capsule form. It’s just more convenient, effective, and safe that way.